During your Main Phase: Excavate cards from the top of your Deck equal to the number of other “Valkyrie” monsters you control, and if you do, add 1 excavated Normal Spell/Trap to your hand, also send the remaining cards to the GY. Otherwise, shuffle all excavated cards into the Deck. 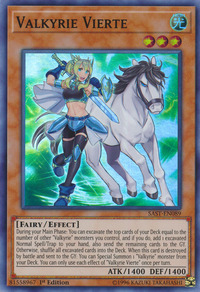 When this card is destroyed by battle and sent to the GY: Special Summon 1 “Valkyrie” monster from your Deck. You can only use each effect of “Valkyrie Vierte” once per turn. Vierte is the German word for fourth.